In todays qualifying round for the 2012 TTXGP race at Infineon, Steve Rapp was riding for Team Icon Brammo in place of the teams regular rider, Steve Atlas, after he was taken out due to a crash yesterday. 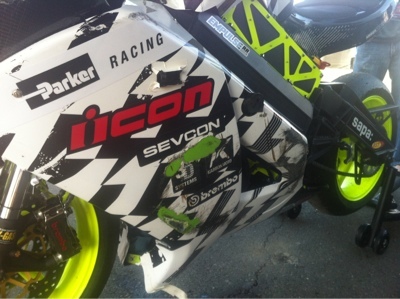 The team had spent all night rebuilding the bike, arriving just in time for the qualifying race. To replace Atlas, Rapp volunteered. 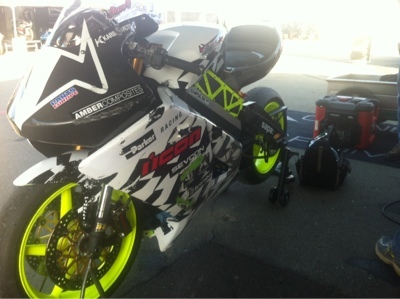 He is a highly experienced rider who knows Infineon Raceway very well, and has ridden for Mission Motors before. 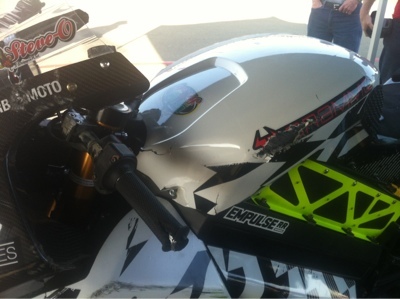 However Rapp had never seen the Brammo Empulse RR before and was coming to it fresh. During the qualifying race he didn't seen to have completed an entire lap at full speed. In one lap he pulled over to the pit wall to confer with team members. It was this lap in which he wrecked. The wreck occurred in lap 7, just before the turn. This is a sharp hairpin turn and is where Atlas crashed yesterday. At this point we haven't heard a clear accounting of what happened and other riders didn't observe it happening. One rider said it looked like Rapp's bike went into the corner too tight. However that corner is a right hander, and all the damage to the bike is on the left side. Brian Wisman said it definitely was not rider error. 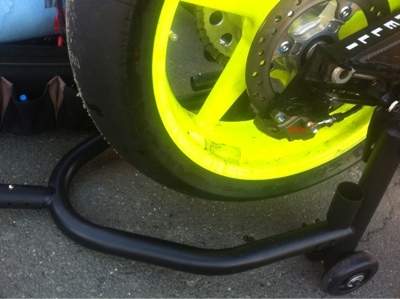 There was cooling fluid on the rear tire which is believed to have been a factor. Wisman expressed his most sincere apology to the other teams for which Atlas and Rapp were riding. Word from the medical center is that Rapp broke his wrist, and is otherwise in good spirits.